This month, Girl Scouts of San Gorgonio kicked off its fall nut and candy sales with a series of picnic extravaganzas designed to teach girls important business skills through fun, old-fashioned games. California's Redlands Daily Facts reports that the activities focused on the Girl Scouts' three keys to success: discover, connect and take action. From broom-balancing to three-legged races, girls learned team building skills while giggling with friends. "We've seen a marked increase in our per girl sales average," said Elizabeth Locke Thomas, vice president of retail and product sales for Girl Scouts of San Gorgonio Council. "We changed our focus from our sale to the girl. By developing a programming piece that encouraged courageousness-that no dream is too big-girls truly started to believe in themselves and their ability to succeed at whatever they put their minds to." Some of the past goals the girls have set for themselves included computers, iPad 2s, a weekend on Catalina Island, sleepovers at the San Diego Zoo, national and international travel, class rings, and more. In the I Care program, people can donate nuts and candy to local charities and deployed military. Girl Scouts made thank-you cards for deployed soldiers. 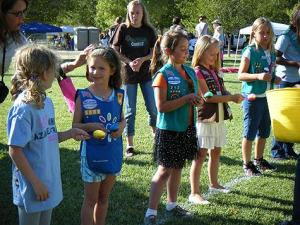 The Girl Scouts of San Gorgonio's nut and candy sale runs through October 10.